North Sumatra: the real-life Shangri-La? You’ve been to Hong Kong so often that you often catch yourself ordering at local hawker centres in Cantonese. Chatuchak market vendors know you on a first-name basis, and even offer to take you out for a meal after their shift is over. Such is the life of a well-seasoned traveller in South-east Asia. It’s nice to be so familiar with these other countries — they can feel like second homes — but it can also feel like there’s nothing left for you to see any more in the region. Or so you might think. Odds are, you haven’t been to the jewel of Indonesia that is North Sumatra — or even if you have, you probably haven’t explored the full scope of what it has to offer. 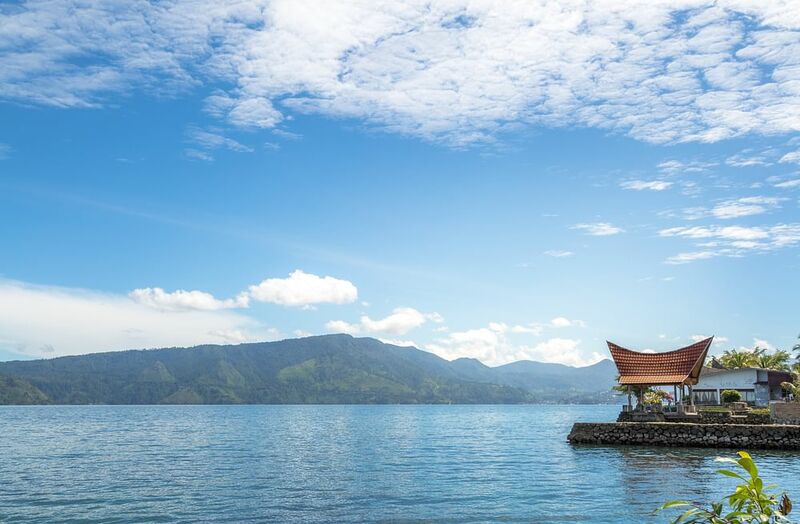 North Sumatra plays host to one of Indonesia’s foremost natural wonders: the pristine waters of Lake Toba attract thousands of visitors every year. At 1,145 sq km, Lake Toba is the largest lake in Southeast Asia. Its main island, Samosir Island, is almost the size of Singapore, and offers some spectacular views of the surrounding mountains from select lookout points, such as at the top of Bukit Holbung — a hill affectionately known as “Teletubbies Hill” for its pastoral scenery. 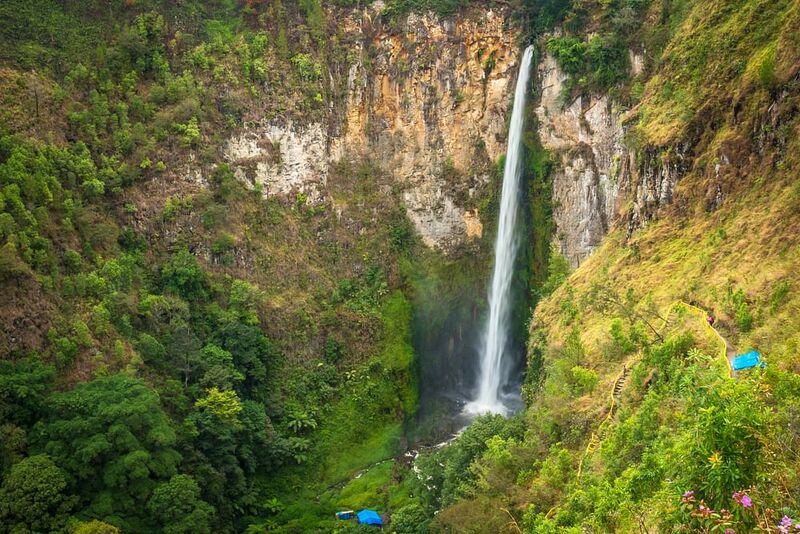 Outside of Lake Toba, one of the star attractions of North Sumatra is the Silpiso-piso waterfall, which takes its name from the Batak word for blade. While the full beauty of the falls can be seen from the visitors’ carpark, the more adventurous can choose to descend to the base. Be warned, though: while a fairly easy descent, the ascent is significantly more challenging. Avid hikers should opt to take the climb up Pusuk Buhit, the rumoured birthplace of the first Batak king. It is also a sacred landmark to the Batak people, who make pilgrimages to receive his blessings. Today, tourists come for quite a different reason: its panoramic vistas of rolling hills are certainly fit for royalty — most of all at sunset, when visitors can watch the fading sunlight turn the valleys beneath it into fields of gold. Indonesia is spread across more than 17,000 islands, giving rise to an incredibly large diversity of cultures over its long history. North Sumatra is home to the Batak people, and boasts a rich history and culture that continues to flourish to this day. Pay a visit to Tomok or Ambarita on Samosir Island, traditional Batak villages where the traditional ways of life are still authentically preserved, from the architecture of the jabu houses to the tor-tor dance. For your friends who aren’t able to accompany you on the trip, there are few better souvenirs to take home to them than an ulos. 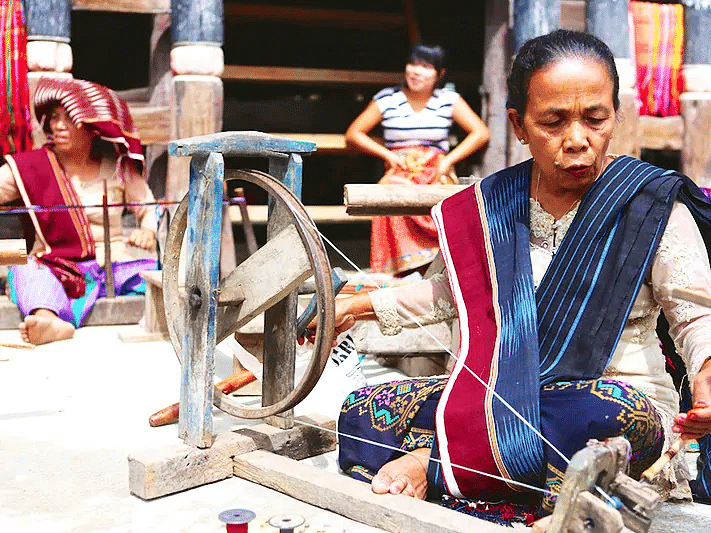 The ulos is a traditional Batak woven fabric that is typically worn either on the head, draped over the shoulders, or tied around the waist, and has made its way into modern Batak fashion as the accessory of choice. Traditionally, different ulos have had different purposes, ranging from birthdays to weddings to funerals, but one thing is common: all of them are strikingly beautiful. 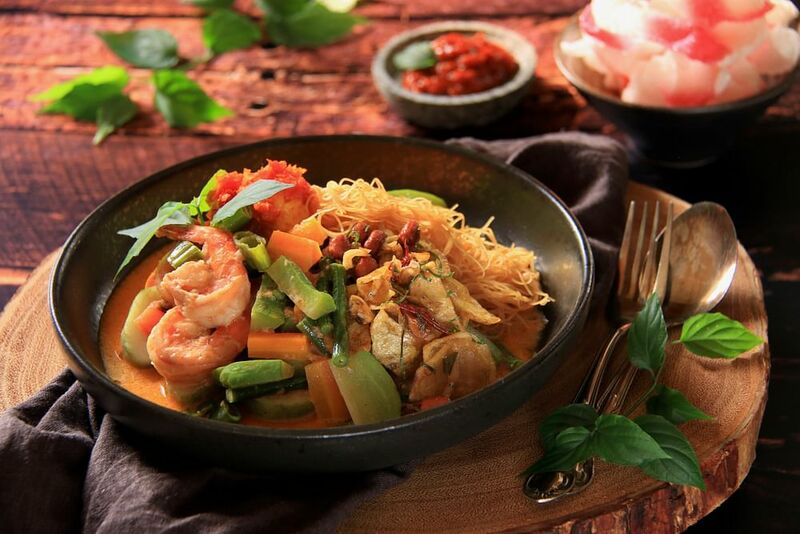 Think Indonesian food is limited to gado-gado and ayam penyet? Think again. While these are both delicious, North Sumatra has an incredibly diverse array of cuisines all its own. The Batak ethnic presence in the region means that there’s no shortage of unique food to sample. Batak cuisine makes use of its own characteristic blend of spices, particularly andaliman, leading it to be dubbed “Batak pepper” in some parts of Indonesia. One of the most common (and delicious) dishes is arsik: Batak-style stewed carp that makes heavy use of torch ginger and andaliman. If you’re taking a trip to Medan, you can’t leave without trying the city’s signature dish, lontong sayur Medan. This dish consists of a familiar vegetable soup with rice cakes that should, on the surface, look familiar to all Singaporeans. However, each establishment in Medan provides their own unique spin on the dish: Lontong Warintek, for instance, tops its lontong sayur Medan with a pile of crispy potato chips, while Lontong Terenak di Dunia’s is accompanied by sweet potato chips, rendang and tauco (fermented soya bean paste). Culinary completionists will definitely want to try them all. But while North Sumatra will leave you with memories of breathtaking scenery and a belly full of delicious Batak cuisine, you’re also guaranteed to take away unforgettable experiences. The majestic sight of Binangalom waterfall is one of the most popular attractions, particularly on hot days, where visitors shouldn’t hesitate to jump in to cool off. If you’d rather stay dry, the waterfall is also a popular spot to fish and birdwatch. For adrenaline junkies, Parapat also has facilities for water skiing, motor boating and kayaking, and is also home to some of the most beautiful golf courses in Indonesia. Interested in exploring the Lake Toba area in a way that’s off the beaten path? Rent a bicycle or motorcycle instead of taking a car or the ferries. Bicycle fees start from as low as 30,000 rupiah a day (S$2.85), making it both an affordable and unique way to get around. A beautiful paradise largely untouched by man, North Sumatra seems like the Shangri-La of myth — but unlike the Shangri-La, it happens to be easily accessible by plane. Most carriers that operate in South-east Asia also fly to Medan, including Singapore Airlines, JetStar Asia and SilkAir. As the largest city in the North Sumatra region, Medan is one of the most convenient bases from which to explore North Sumatra. From Medan, it’s a 176km-drive to Parapat, the town next to Lake Toba. The journey is about six hours by bus, and potentially shorter if you hire a rental car and driver. Once at Lake Toba, a variety of accommodation is available, from the ultra-luxurious Tiara Bunga Hotel and Villa, to the Dutch-style Inna Parapat Hotel. Regardless of your travel style, there’s something for everyone. Ready to start planning your trip? Head over to www.indonesia.travel for additional information.